King Street Wesleyan Church, Leigh (in Lancashire) was the main church in the Leigh Circuit. Built in 1870 it has since closed. 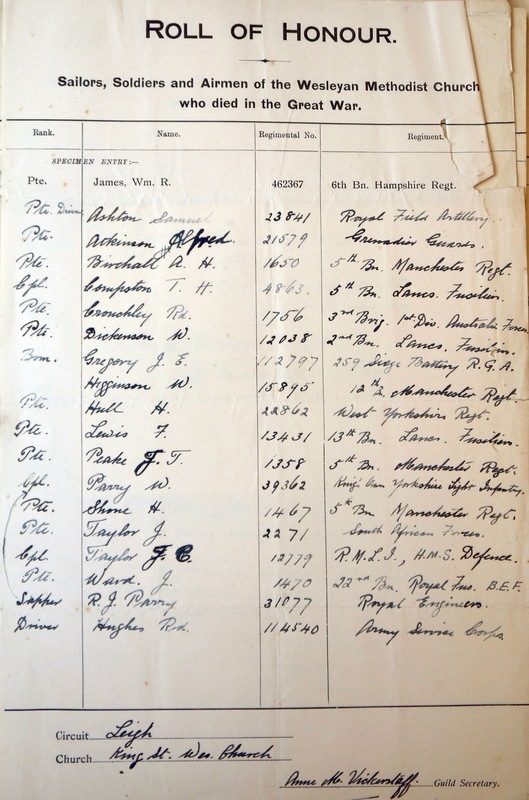 A memorial is recorded, but this list appears to be the only full list of the eighteen men who died. Pte. A.H. Birchall 1650 5th Bn. Manchester Regt. [L/Cpl.] W. Higginson 15895 12th Bn. Manchester Regt. Pte. H. Hull 22862 West Yorkshire Regt. Pte. J.T. Peake 1358 5th Bn. Manchester Regt. Pte. H. Shone 1467 5th Bn. Manchester Regt. Pte. J. Ward 1470 22nd Bn. Royal Fusiliers, B.E.F.